about Angel Cats click the image. 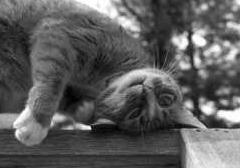 Read true stories about a feline friend with a "sixth sense" who intuitively comfort living and dying nursing home residents in Nashville. Three healer cats help a man get his "purr" back after he collapses from exhaustion. A cat named Pumpkin saved the life of a family during wartime and kept his promise to a dying mother to keep her daughter safe from harm. A mother-daughter duo becomes kitty cardiologists and pacemakers who restart a woman's heart when it stops beating during the night. Two playful sister cats coax a major league baseball outfielder through a losing season. An intuitive cat gives healing massage to a breast cancer patient. And many more stories of cats bringing comfort to those who need it. Meet Cuddles, the Andersons' cat who writes her own advice column, "Ask Cuddles" to let you in on secrets of what cats really think. Angel Cats proves that cats are as compassionate as they are cautious. While dogs get more credit, cats have perennially proven themselves to be every bit the equal of their canine brethren as humankind's best friend. 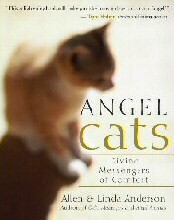 Angel Cats, inspired by a contest authors Allen and Linda Anderson ran to find the "Best Angel Cat" stories, shows the often-extraordinary ways in which these fascinating creatures respond to human need. Click Calendar of Events to view Angel Cats and other Angel Animal Network events and interviews in your area. Click ANGEL ANIMALS to read about the Angel Animals Network. The term Angel Cats ™ is a trademark term.